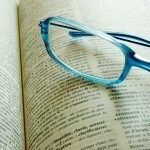 Often students believe a dictionary can only provide them with the meaning of a word, and while it is true that this is sometimes the main use of dictionaries, it is by far not their only use. It is very important to make students aware that dictionaries will also provide them with very useful grammar and pronunciation information that can be indispensable for them to properly learn the new vocabulary. It is also important to make students aware that each word can potentially have more than one definition and, ideally, they should be able to identify which definition they need or which definition applies to the context they have found the word in. One of the most important activities you can do with students is help them identify all the parts of a dictionary entry. The image below exemplifies something you can do. This definition was taken from the Oxford ESL Dictionary. The answers (clockwise) would be: Word, Pronunciation, Part of Speech, Definition (x4). – What are the guide words on the page where you found ‘bear’? – How many syllables does ‘dragonfly’ have? – Which animal has a beak? – The word ‘shadow’ in this sentence is incorrect: “We sat in the shadow of the tree.” What word should it be replaced by? For the race the questions are placed at one end of the room, while the dictionary is at the opposite end. You can set up as many teams and dictionaries as necessary depending on the size of your class. One student at a time picks a question and runs to the dictionary to find the answer. The student then runs back to the team to complete the handout or show the answer to the teacher so that the next team member can continue the race. These questions can be easily tailored to the students’ level and will help develop the students’ dictionary skills as well as their vocabulary and general reading comprehension skills. After students have interacted with dictionaries, asking them to create their own picture dictionaries or their own vocabulary booklets is a great way to help them increase their lexicon. Furthermore, after students have learned about different parts of words (the root word, prefixes and suffixes) as well as word families, another fun game that can be played with intermediate or advanced learners is asking students to guess and write down definitions for words that are not fully familiar for them. Once students have presented their ‘homemade definitions’, a dictionary is checked and the definition closer to the one in the dictionary is the winner. This game can be made more challenging if a timer is set as well. A final activity or guessing game would ask students to match words with definitions. One word can be highlighted in a sentence or short paragraph and then a number of definitions from the dictionary are provided and students must match the word in the sentence with the correct definition. This can be done with words that have multiple meanings for higher levels as well. Using dictionary games for teaching English is a fun way to teach students how to use this great resource!